Hundreds of Second Amendment supporters rallied in Augusta on Saturday, joining crowds across the nation who gathered in response to recent anti-gun violence protests that many gun owners see as a threat to their right to bear arms. 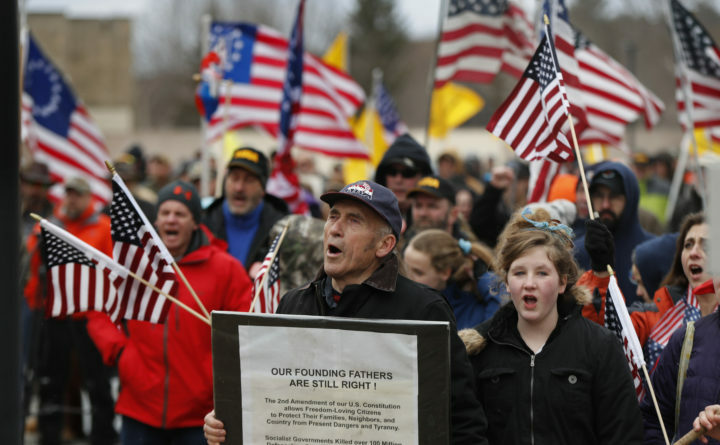 “Gun owners have been portrayed in a negative way and it is our hope that this peaceable rally will show that we are safe, law-abiding individuals that happen to take our constitutional rights very seriously,” said Dave Gulya, an organizer for the Maine event. Forty-five other rallies were planned across the country, all sponsored by The National Constitutional Coalition for Patriotic Americans. “A silent majority” of Maine gun owners has felt defensive in recent weeks, after a teenage gunman killed 17 people with an assault-style rifle at a school in Parkland, Florida, in February, Gulya told the BDN. The Parkland shooting reignited widespread calls for lawmakers to pass tighter gun restrictions — but unlike in the wake of other mass shootings, it galvanized America’s youth, who spearheaded a series of marches and walkouts last month that added a new dimension to the country’s fraught political debate over guns. Between 600 and 800 people gathered from 2 p.m. to 4 p.m. in the plaza between the State House and the Cross State Office Building, according to an estimated crowd count by Capitol Police. Billed as the “Americans for America” rally, many rally-goers held American flags and implored the country to “come together,” according to WABI. Under a gray cloudy sky, they carried signs that read, “Let teachers protect my life now!” and “Gun free zones kill!,” tweeted Maine Public Radio. Proposals to allow Maine schools to allow staff to carry firearms failed earlier this year in the Legislature, which remains largely gridlocked on gun rights and gun control issues. About 50 people spoke to the cheering crowd — some of them only to say their name and to voice their support for the Second Amendment — and the line-up included a scheduled slate of prominent Maine gun rights proponents. Gesturing toward the State House behind her, former Maine Health and Human Services commissioner and Republican gubernatorial hopeful Mary Mayhew at one point told the crowd, “There’s a lot of emotion out there right now, and you know what happens here in this building far too often: they pass laws in response to emotion that takes away our liberty and our freedom,” according to a Facebook livestream of her three-minute speech. Gubernatorial candidates Sen. Garrett Mason, R-Lisbon Falls, and Gorham businessman Sean Moody also spoke, said Gulya, as did Sen. Eric Brakey, an Auburn Republican who is running for his party’s nomination to challenge U.S. Sen. Angus King in November; Mark Holbrook, a Brunswick Republican running against Democratic U.S. Rep. Chellie Pingree in the 1st District: and Franklin County Sheriff Scott Nichols. Before the rally, some told local media outlets they were afraid that gun rights supporters would bring their firearms to the State House plaza, which is a gun-free zone. But no one appeared to be armed on Saturday, heeding the directions of the rally organizers, said Capitol Police Chief Russell Gauvin. “I don’t think we had any issues whatsoever,” he said.